I've often heard it said that bad things happen in threes, but what about good things? Yesterday was one of those days for me. It was Day 14 of my 18 Day Challenge. The number of prompts in my Bracelets 4 Buildings hat is quickly dwindling. It sits on my desk, just beyond my computer, waiting for me to finish the morning blog post. My prompt on Thursday was "a rocker that I have not painted yet". Several suggestions had come in when I shared the concept of the challenge, including Steven Tyler from Aerosmith and James Hetfield from Metallica. 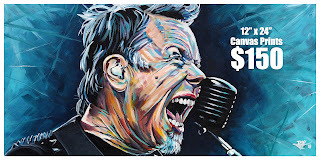 I went with Mr. Hetfield for no other reason than he was the first one to pop into my mind. As I was preparing to go outside and start, I had to do a few things in our guest bedroom downstairs. We had a guest arriving and I needed to clean the linens and that kind of thing. On the wall is my absolute favourite abstract piece of art from my friend Sharon Heading. One glance at it gave me an idea for how to do the background using teal on black. I went three rounds with this portrait of the lead singer of Metallica, the first ending at 9 am. By the end of stage two, enquiries started pouring in. 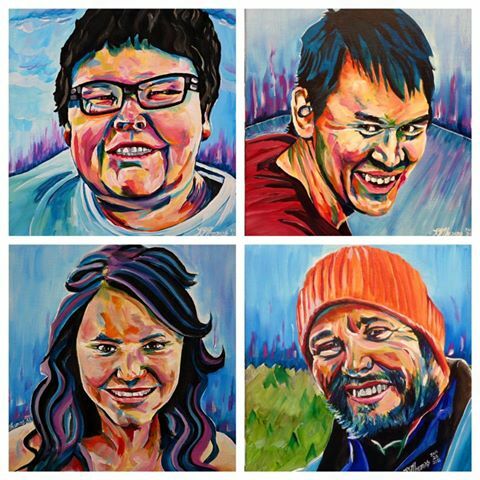 Half way through stage three, T-Wolfe out in BC bought the painting and requests starting coming in for prints. I have to say that this kind of interest in a painting doesn't happen often. However, when it does, it sure feels good. So, thanks to everyone who reached out and asked about it. Proceeds from the sale of this 12" x 24" portrait of James Hetfield will support our efforts with Bracelets 4 Buildings this winter. Our family will be sponsoring the construction of a home for a family who is probably existing in a less-than-ideal shelter in a rural village in Cambodia. Sales of canvas prints of the same portrait also support our charitable and humanitarian works. 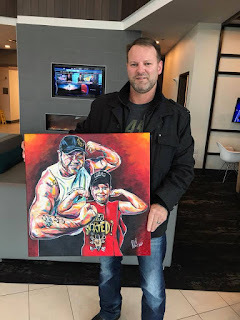 If you're interested in ordering a custom print, just send me a private note on my Russell Thomas Art Facebook page, or email russell.thomas@birdsongconnections.com. Hetfield's portrait was drying and I was emerging from my midday cat nap when the door bell rang. Alicia had arrived from La Loche, Saskatchewan. She had made the two and a half hour trip on the winter road to meet me in person. On Monday, it will be two years since her two beautiful sons, Dayne and Drayden, were tragically shot to death along with two others in the community. A friend of mine, Melissa Herman, was devastated by the news and wanted to do something meaningful for the people of La Loche. She approached me to ask if I would consider accepting a commission to paint portraits of all four of the victims. At first, she talked about doing a fundraising campaign to pay me. "Money is the last thing in the world you need to be worrying about right now," I said. "This will be a gift from our family to the community." After the paintings were done and delivered, and in the midst of her unfathomable grief, Alicia was so gracious and kind. We talked then about meeting each other in person, but it just never happened at the time. We were able to have a lovely visit and she and her granddaughter were able to visit Birdsong Studio where the portraits of her boys came to life. The third good thing that happened yesterday related to a painting that I had done way back in September. 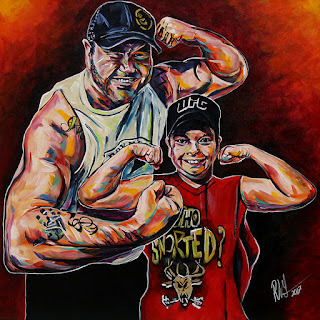 Sandy Bowman, Dwayne Lewis and Dwayne Lauzon had commissioned me to paint a portrait of the late fighter Tim Hague and his son, as a gift to the grieving family. Tim tragically died after he was knocked out in a heavyweight fight in Edmonton. He was a passionate fighter and a dedicated teacher and father. We couldn't share images of this one until it was delivered to the family. That happened yesterday. According to Sandy, there were lots of emotions and tears when it was unveiled. The painting attempts to capture the love of a father for his son, and vice versa. I'm deeply grateful for the abundance of good that happened yesterday, and all who were a part of it. Thank you.